As the problem with obesity becomes more prevalent in society, you might begin to take a closer look at your daily diet. When grocery shopping, a variety of foods claim to be “low-calorie,” “heart healthy” and “fat-free.” Including fat-free cheese in a weight loss plan can be beneficial, though there are other factors to consider. Cheese contains phosphorous, protein, vitamin A, vitamin B-12 and zinc. Fat-free cheese contains fewer calories than its regular counterparts making it a healthier alternative when your goal is to lose weight. It is also an excellent source of calcium, which is important for maintaining the health and vitality of your bones. The Academy of Nutrition and Dietetics recommends that women consume at least 1,000 milligrams of calcium daily. This may decrease your risk of osteoporosis, a medical condition that occurs when the bones become brittle and fragile. Most regular types of cheese are not only high in fat, but also cholesterol. When consumed, saturated fats, trans fats and cholesterol significantly increase your risk of developing coronary artery disease and/or atherosclerosis. The major benefit of fat-free cheese is that it does not contain any fat or cholesterol. However, manufacturers often add ingredients to fat-free foods to improve taste. Oftentimes, this extra ingredient is sodium. The Daily Plate website shows that 1/4 cup of regular cheddar cheese has 180 mg of sodium, while 1/4 cup of fat-free cheddar cheese contains 280 mg of sodium. Keep this in mind if sodium intake is a concern for you. Low-fat and fat-free cheeses make appropriate snacks for a healthy eating plan. This healthy snack not only provides calcium and protein, but also supplies a necessary boost of energy between meals. 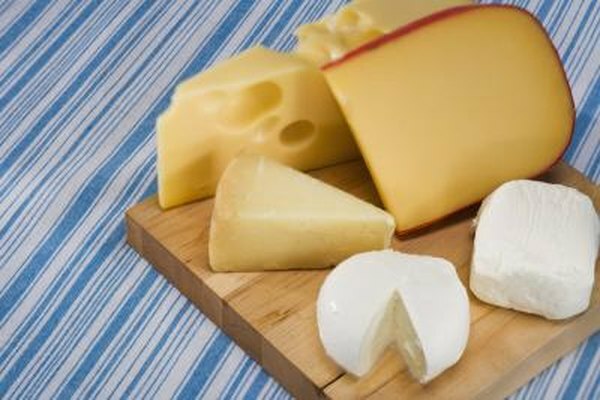 The American Heart Association recommends including fat-free and low-fat cheeses in your daily diet. Although fat-free cheese can be safely included in a healthy diet, opt for cheeses that are not only fat-free, but also low in sodium. In fact, low-fat and fat-free dairy products, including cheese, are a recommended food group in the Dietary Approaches to Stop Hypertension, or DASH, diet, according to the Women’s Heart Foundation. When you do use fat-free cheese, do not allow the “fat-free” idea to encourage a larger portion that necessary. Fat-free cheese still contains calories, and when you are trying to lose weight, those extra calories can add up to unsuccessful weight loss.